Anyone who’s ever feared being eaten by a shark may want to look away now... One US marine researcher captured an uncomfortably close encounter with an 11-foot shark as it took a chunk out of his camera. Greg Skomal, a shark researcher with the Massachusetts Division of Marine and Fishery, was out with the Atlantic Shark Conservatory in Chatham, Massachusetts on Monday when he found himself in an unusual tug-of-war with the great white. 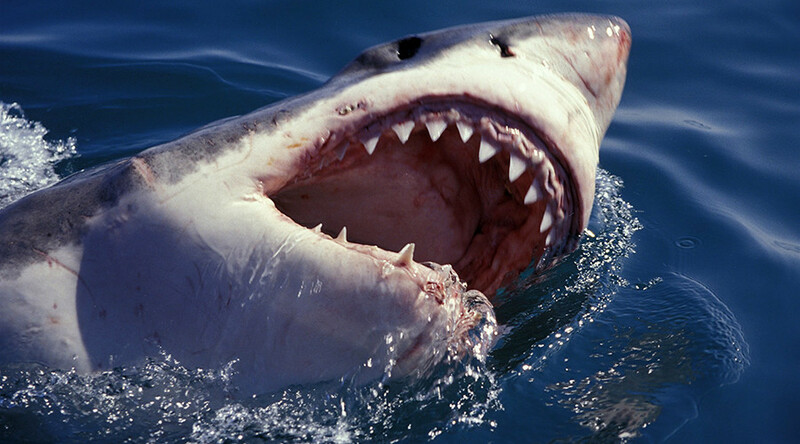 The video shows the shark grab the camera in his mouth, giving a unique – if horrifying – view of inside the great white’s mouth, and its rows of jagged teeth. Posted online by the Massachusetts Division of Marine and Fishery on August 1, the footage has been viewed more than 15,000 times. “Every week is #sharkweek for DMF Scientist Greg Skomal! Check out this amazing underwater footage of one of the regions visiting white sharks from yesterdays [sic] research trip! Atlantic White Shark Conservancy #chomp #ourcameraisjustfine,” the page said. After taking its first bite, the shark circles back for a second nibble, flashing its pointy white teeth at the camera. Skomal has been up-close with plenty of sharks, but this was the first to take a bite of his equipment. According to Skomal, the shark was likely having a taste to learn more about what the camera was, rather than being predatory.